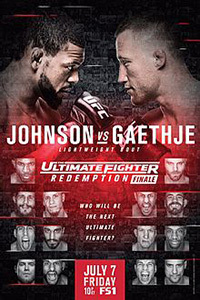 The Ultimate Fighter 25 Finale: Johnson vs. Gaethje took place July 7, 2017 at T-Mobile Arena in Las Vegas, Nevada. Click the stars to rate how good you think the TUF 25 Finale was. • Michael Johnson vs. Justin Gaethje: Justin Gaethje def. Michael Johnson via TKO (strikes) at 4:48 of Round 2. • Dhiego Lima vs. Jesse Taylor (TUF 25 Final): Jesse Taylor def. Dhiego Lima via submission (rear-naked choke) at 0:43 of Round 2. • Marc Diakiese vs. Drakkar Klose: Drakkar Klose def. Marc Diakiese via split decision (29-28, 28-29, 29-28). • Jared Cannonier vs. Nick Roehrick: Jared Cannonier def. Nick Roehrick via TKO (strikes) at 2:08 of Round 3. • Brad Tavares vs. Elias Theodorou: Brad Tavares def. Elias Theodorou via unanimous decision (29-28, 29-28, 29-28). • Marcel Fortuna vs. Jordan Johnson: Jordan Johnson def. Marcel Fortuna via unanimous decision (29-28, 29-28, 29-28). • Angela Hill vs. Ashley Yoder: Angela Hill def. Ashley Yoder via unanimous decision (30-27, 30-27, 30-27). • Tom Gallicchio vs. James Krause: James Krause def. Tom Gallicchio via unanimous decision (30-27, 30-27, 30-27). • C.B. Dollaway vs. Ed Herman: CB Dollaway def. Ed Herman via unanimous decision (29-28, 29-27, 29-27). • Juliana Lima vs. Tecia Torres: Tecia Torres def. Juliana Lima via submission (rear-naked choke) at :53 of Round 2. • Teruto Ishihara vs. Gray Maynard: Gray Maynard def. Teruto Ishihara via unanimous decision (30-26, 30-26, 30-26).